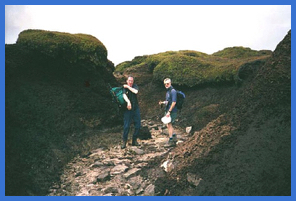 Following Mick and my participation in the Hope Moors and Tors Challenge Walk in October 2000 we resolved that we would spend a day on Kinder with the "Boys" and would investigate the plateau (Peat Bogs) to a greater extent. So with Larry and Ray alongside we ventured north from Warwickshire almost as soon as we could after Kinder had been open once more to the public following the Foot and Mouth outbreak. Edale, the starting point for this ramble, was reached at about 10.30 a.m. Unlike most other times I have been to Edale the car park was comparatively empty so it looked as if Kinder would not be too crowded. Boots on, rucksacks checked - making sure we had our sandwiches and water - and we were off. 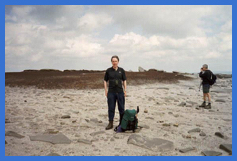 As usual I had my trusty walking poles ready to tackle the pull up Kinder via Heardman’s Plantation and Ringing Roger so we would reach the perimeter path on the southern edge of Kinder at the top of Golden Clough. 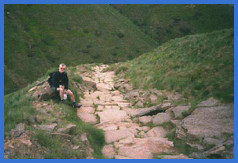 We had considered the walk up Grindsbrook Clough. 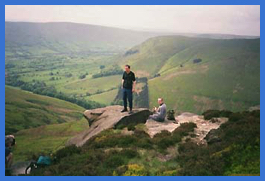 However, as we wanted to go across the bogs to Kinder Downfall by going up via the Grindsbrook we would have missed many of the views across the Edale Valley that can be enjoyed to the west of the top of Golden Clough. A second reason was I always feel it a lot easier to go up via Golden Clough. Although you reach the same height it always seems less of a grind. So soon the car park was behind us as was the Nags Head, the pub at the starting point of the Pennine Way. I think we all made a mental note to visit it on our return. We crossed the bridge over Grinds Brook and walked along the flat slabs that have been laid to protect this busy right of way. However, before too long we turned off right to start the zig zag path to the top of Golden Clough and the edge of the Kinder Playeau peat bogs. 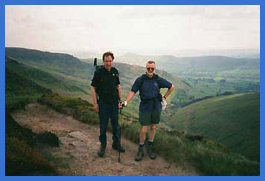 The Golden Clough path is initially steeper than the Grindsbrook path and so very soon we were well above the early stages of the Grindsbrook route. The views were superb as visibility was particularly good and while Mick and Larry speed to the top Ray and I took it easier and enjoyed the splendour of the elevation. That was our excuse! I could easily see across the Edale Valley to the Great Ridge between Castleton and Edale. This revived some of the memories of the Hope Moors and Tors Challenge Walk. With in an hour of leaving the car park in Edale we were above Golden Clough and the four of use took a welcome break. Using rock outcrops as seats we sat and admired the view and enjoyed late elevenses before following the path that took us westward to the top of Grindsbrook Clough. This is a lovely walk. 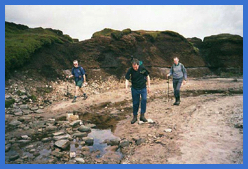 The peaty path is easy on the feet and thanks to the local rangers the worse of the boggy bits have been covered by large flat rock slabs. To the south is the beautiful vista of the Edale Valley and later we were able to look down into Grindsbrook Clough and I’m thankful that I’m not clambering over the rocks near the top of the clough that makes any sort walking rhythm impossible. 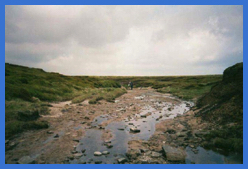 It was now the intention to follow a path that went across the peat bogs to Kinder Downfall. On the map it looked a very obvious path but on the ground it was less easy to spot – we couldn’t find it - so we followed an obvious route that went west hopeful that we would come across a track that would lead us north to the "Downfall". We never found one so on reaching Edale Head or thereabouts we decided to walk northwest across the bogs to reach our destination. Fortunately I had my GPS with me so all I needed to do was lock on to the grid reference for Kinder Downfall and follow the arrow on the instrument's display. Easy? Not quite. 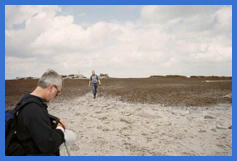 Initially we were bog jumping and I almost lost one of my boots when a particularly hungry patch of Kinder bog seemed intent on sucking by boot off. However, we quickly realised it would be a lot easier to walk in the groughs (the deep drainage channels that cross the plateau) which, because of the recent good weather were comparatively dry. The grough we walked in, although its course twisted, was going in the general direction of Kinder Downfall so we followed this, which turned out to be a tributary of the River Kinder. This took us all the way to the "Downfall" which, like the river, was devoid of any significant amount of water. However it had been very interesting walking. The later stages being almost like walking along a small estuary towards the sea when the tide is out. It was now lunchtime. Our stomachs were receiving this message, which also seemed to being communicated to the local inhabitants – sheep – that were soon looking greedily at our sandwiches. Being hungry and not wanting to start another Foot and Mouth epidemic – some of us were eating meat – we kept our food to ourselves. Even Ray’s fondness for animals was severely strained as we did our best to shoo the sheep away while we enjoyed the view of Kinder Downfall and Kinder Reservoir, which could be seen in the distance. Unfortunatly, it took the sheep a long time to realise we did not intend to feed them despite them lining up and looking quite aggressively at us. At on point we thought they might even "mug" us for our lunch. It was therefore nice to get walking again leaving the woolly predators behind as they, no doubt, prepared to intimidate the next group of walkers that were hoping for a quiet picnic. We were now heading south along the Pennine Way to Kinder Low and the trig point that denotes it as being 633 metres above sea level – 3 metres less than Kinder Scout which at 636 metres is the highest point on the plateau. Carrying on southwards we passed the Swine’s Back out crop of rocks before continuing along the Pennine Way to the top of Jacob’s Ladder, which is a very very steep stone pavement. Here we were surprised when a couple of cyclists overtook us. They obviously had good brakes and nerves. They needed both to cycle down the steep gradient. At the bottom of this incline is a beautiful little packhorse bridge. This route evidently was well used before the advent of more modern transport and was the main trading route between Edale and Hayfield. I sure pity the poor pack animals that had to carry their loads up this hill. From here, with the exception of two or three minor gradients, it was more or less an easy walk along the Pennine Way via Upper Booth back to Edale. Needless to say after changing footwear and dumping rucksacks in the car boot it was off to the Nags Head for a pint or two and an opportunity to reflect on our day on the Kinder Plateau.